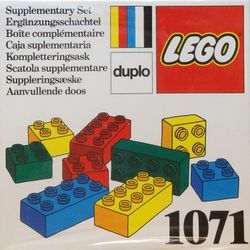 1071 Bricks 2 x 2 and 2 x 4 is a DUPLO Basic (Dacta) set that was released in 1986. The set includes fifty-six parts. Facts about "1071 Bricks 2 x 2 and 2 x 4"
This page was last edited on 3 May 2016, at 23:46.